Students from the University of Tennessee are planning to host a virtual open forum as they continue to explore alternative designs for the intersection at Pennsylvania and North Tulane Avenues. The event will be accessible via Facebook Live on Wednesday, April 3, from 5 p.m. until 6 p.m. The effort is part of a senior project for the students from UT’s College of Civil and Environmental Engineering. The City of Oak Ridge Public Works Department teamed up with the group to evaluate designs that would potentially realign the intersections of North Tulane Avenue, Pennsylvania Avenue, Providence Road, and East Pasadena Road. The students held their first open forum in early March at Oak Ridge Public Library where they introduced themselves and gathered public opinions and concerns. In the upcoming open forum, students will build on the feedback received so far and present conceptual drawings of alternatives that are under consideration. Participants will be able to view and interact with the event in real time from their computer or mobile device. 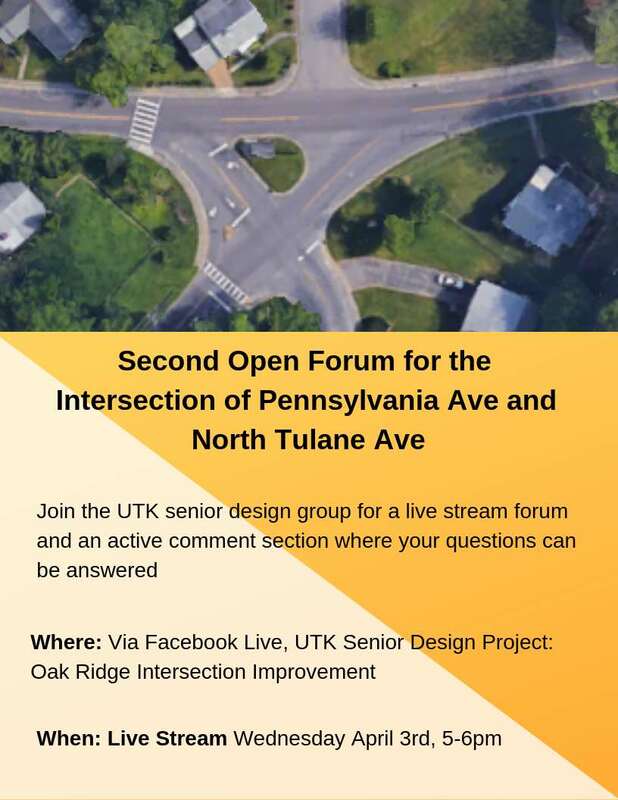 The live stream will be hosted on the students’ Facebook page for the project, which can be found as "UTK Senior Design Project: Oak Ridge Intersection Improvement." Oak Ridge residents are encouraged to view and engage with the students during the virtual open forum. Questions can be directed to the Public Works Department by emailing PubWorksDis@OakRidgeTN.gov or by calling (865) 425-1875.